As part of our environment agenda, we have a staff-driven programme called E-Green Team that is focussed on environmental conservation through tree planting. E-Green Team provides a unique opportunity for staff to own, develop and manage a key area in the company’s social responsibility agenda. There is an open invitation to staff to become members and contribute to environmental preservation through tree planting activities. 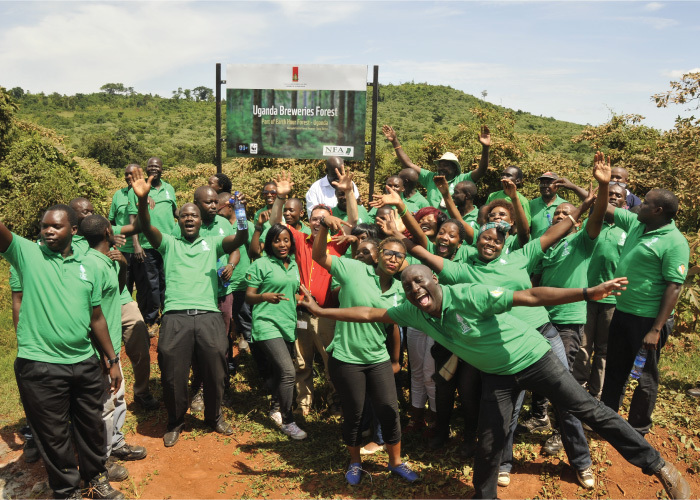 Over the years the team has planted trees in Kamokoli community in Eastern Uganda, Nabitoli catholic parish, Budaka in Wakiso with different partnerships with like-minded companies like Standard Chartered Bank, Eco Trust, NEMA, NBS TV, DHL Uganda and NTV Uganda. More recently, the team restored 109 hectares of forest cover to the Navugulu Forest Reserve in partnership with the National Forestry Authority (NFA) and World Wide Fund (WWF), allowing for the forest to serve its purpose as a catchment for Lake Victoria, thus contributing to less pollution upstream.